Unnamed Cemetery #22 off Gumm Cemetery Rd. Cemetery on the border between Hancock and Baldwin Counties. From the Hancock County Courthouse, go west on Hwy 22 for approximately 15.1 miles to Lake Laurel Rd on the right. Follow Lake Laurel Rd for 1.4 miles to Gumm Cemetery Rd on the right. Go 1.8 miles to the power lines and 266 Gumm Cemetery Rd. On your right is a field road under the high power lines. Follow this road and cross the pasture to get to the cemetery. The cemetery is 0.4 mile down the power line easement and is past the intersection of more power lines coming in from the left. 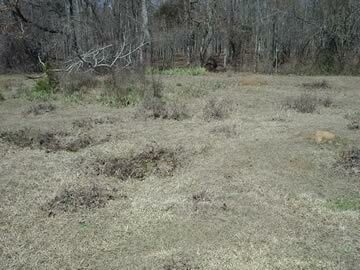 It is on the left side of the easement next to the woods. This is the same cemetery as Unknown Cemetery #4 on Gumm Cemetery Road in the Baldwin County Cemeteries website at http://friendsofcems.org/Baldwin. Cemetery appears to be in Hancock County based on DOT and topographic maps.